How Much Glyphosate Is In You? Author SimaPublished on October 26, 2017 October 27, 2017 Leave a comment on How Much Glyphosate Is In You? Once again the controversial herbicide (weed killer) glyphosate is in the news. Glyphosate is the active ingredient in Roundup (manufactured by Monsanto), and is the most commonly used pesticide in the world. Its use is increasing annually since the introduction of genetically modified crops that are tolerant of glyphosate being sprayed on them (Roundup Ready crops), and since the use of "preharvest" applications of Roundup. Over the years the US government has generally NOT been tracking how much glyphosate residues are in the foods we eat, but whenever a food is studied for glyphosate residues - they are found. (see all posts) Which means people are constantly ingesting low levels of glyphosate residues. But what does that mean for humans? A recently published study of 100 adults over the age of 50, residing in Southern California, and followed from 1993 to 2016, looked at detectable glyphosate and its metabolite aminomethylphosphonic acid (AMPA) residues in urine. They found that the number of people with detectable residues in urine, and also the actual levels found in the urine, really, really increased in the 23 years. 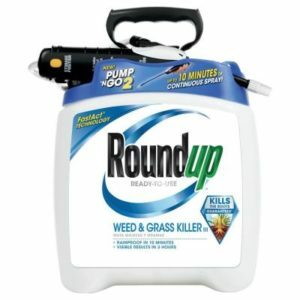 The percentage of people who tested positive for glyphosate shot up by 500% in that time period - from 12 percent of the samples to 70 percent. WOW! Are there health effects from constant ingestion in food from low levels of glyphosate? We don't know, because the studies on humans have not been done. There are a number of health concerns, including that it is a carcinogen (it has been classified as a "probable carcinogen" by some agencies), liver and kidney damage, that it acts as an antibiotic and disrupts the gut microbiome, and endocrine disruption. The researchers of this study are especially concerned about possible glyphosate health effects on the liver (liver disease), based on animal studies (animals exposed chronically to very low levels), and want to research this further. However, the EPA keeps insisting it's safe (and to please ignore the conflicts and deals done with Monsanto in recent years), and actually raised the levels allowed in 2013 (due to corporate lobbying). Also, glyphosate is still not monitored by the Department of Agriculture's pesticide data program or the CDC's (Centers for Disease Control and Prevention) monitoring program of human exposure to environmental chemicals. What can you do? Try to eat as many organic foods as possible because glyphosate (and Roundup) are not allowed to be used in organic farming. And don't use Roundup on your own property - because you can be exposed to it numerous ways (drinking and eating it in food, inhalation, through the skin). Levels of glyphosate, a controversial chemical found in herbicides, markedly increased in the bodies of a sample population over two decades, a study published Tuesday in a US medical journal said. The increase dated from the introduction of genetically-modified glyphosate-tolerant crops in the United States in 1994. Researchers compared the levels of glyphosate in the urine of 100 people living in California. It covered a 23-year period starting from 1993, the year before the introduction of genetically-modified crops tolerant to Roundup. Glyphosate-containing Roundup, produced by US agro giant Monsanto, is one of the world's most widely-used weedkillers. "Prior to the introduction of genetically modified foods, very few people had detectable levels of glyphosate," said Paul Mills, of the University of California at San Diego School of Medicine, the study's principal author. Among the study group, detectable amounts increased from an average of 0.20 micrograms per liter in 1993-1996 to an average of 0.45 micrograms in 2014-2016. In July, California listed glyphosate as carcinogenic, and the World Health Organization International Agency for Research on Cancer called it "probably carcinogenic" in 2015. There are few human studies on the effects of glyphosate, but research on animals demonstrated that chronic exposure can have adverse effects, said Mills. Along with the European Commission's proposal on Tuesday, the European Parliament approved a non-binding resolution calling for the chemical to be banned by 2022. Previous article:Is This A Cause of Dyslexia? Next article:Are Some Microbes Traveling from The Mouth to the Gut and Causing Problems?